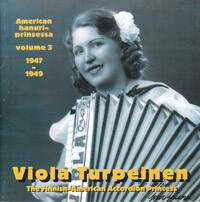 Viola Turpeinen (1909-1958) was the best-known Finnish-American accordionist of her time. She toured widely in Finnish communities and made a large number of recordings with the violinist John Rosendahl and her own orchestra. 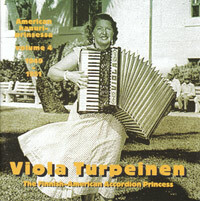 She was probably the first woman in the world to record accordion solos. She was a beautiful woman with blue Finnish eyes and light brown hair. She wore colourful dresses and often had a flower in her hair when she played. Her name VIOLA was boldly embroidered on her piano accordion. 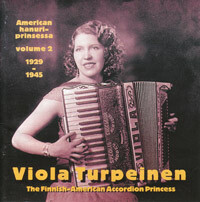 Her repertoire consisted mostly of Finnish dance music, but she also played Italian virtuoso accordion pieces and arrangements of classical music. Her own favorite was the overture from Rossini's "The Barber of Seville". 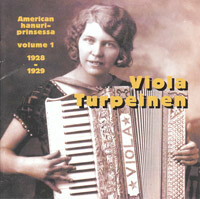 Viola Irene Turpeinen was born November 15, 1909 in Champion, Michigan. Her mother Signe Viitala was born in the same town in 1892. Her father Walter Turpeinen, a miner, was born in Kivijarvi, Finland. Viola had two sisters. When she was a child, the family moved to Iron River, Michigan. Across the street from their home on Cedar Avenue was Bruno Hall, the meeting hall of Italian immigrants. Viola would often hear the strains of accordion music emanating from the hall, and whenshe was fourteen, her father bought her a two-row accordion. She later on switched to the piano accordion. Her first teacher was an Italian named Bianchi from the nearby town of Caspian. Soon she was playing for dances at Bruno Hall and the local Finnish Workers' Hall. Subsequently she continued her studies at the Piersante School of Accordion in Chicago.